MUA is a deeply Latina immigrant organization. Our identity is not only reflected in our language, culture, meetings, policies, and politics but also in the values and purpose of the organization. Given that the Latina immigrant woman experiences the intersections of gender, race and class oppression, our leadership is key to the development of sharp strategies for the social justice movement. Our voice is able to help create a vision of justice, equality, and inclusion for the entire society. We value the leadership of immigrant women and we seek to construct an organization that is able to develop and support our leadership not only to advance but live our mission. The doors of MUA are open to every person that identifies as a Latina immigrant woman. Of them, MUA prioritizes serving and developing the leadership of those that do not receive resources or support from other organizations either because they speak Spanish or other indigenous languages of Latin American countries, or for her socio-economic situation, her education level or her immigration status. We give referrals to every person that is not able to benefit from what we offer to our network of allied organizations. MUA is committed to develop the abilities and leadership of Latina immigrant women via capacity building that deepens our members’ ability to guide programs and campaigns and implement the work of the organization. MUA dedicates our resources to leadership development beginning when a woman enters our organization. This enables immigrant women to develop ourselves as volunteer leaders of committees or the Board of Directors and with the opportunity to apply for and obtain staff positions within MUA and/or with other organizations. 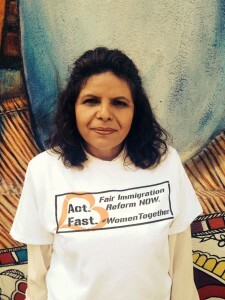 We recognize the abilities and strengths of Latina immigrant women as key and important to our organization. We value life experience as well as formal education. We believe that Latina immigrant women are able to fill the positions of the organization whether it be in the areas of program management, direct services, organizing, administration, or fundraising. We prioritize filling paid positions of the organization with Latina immigrant women who have the necessary abilities and who commit to developing the skills needed for the work. MUA allows each person to self-define as to whether she is or is not a Latina immigrant woman. MUA is committed to providing the professional development support needed so that every staff member is able to accomplish her work. We encourage our staff, Board, and committee members to learn what they need in order to be able to improve and serve the community connecting with other services, communities, or sources of support, participating politically with our allies, and developing relationships with donors and foundations. As an expression of our value of the voice, experience, and leadership of immigrant women, MUA prioritizes that immigrant women from our base represent us in the media and our political alliances. We dedicate specific resources to prepare them to do this very important work. The main language of MUA is Spanish. MUA values whatever language or dialect a woman speaks or wishes to learn respecting her level and pace of learning. MUA maintains our commitment to the development of the self-esteem and leadership of immigrant women regardless of their language skills. MUA plans activities para challenge the barriers that immigrant women confront when they are learning a new language and offers support a women who are trying to improve their English or their Spanish. We recognize that there are connections and specific perspectives that those who are not Latina immigrant women bring to our organization. Furthermore, we recognize that we are living within a very diverse society. We value solidarity amongst people of different races, cultures, genders, and diverse sexual orientations, we know that we are able to and should learn one from the other and respect the importance of relating to others. For this reason, we have decided to continue being an organization whose staff, Board, volunteers, and donors are both immigrant women and non-Latina immigrant women if and when they demonstrate respect for immigrant women. We recognize that MUA has a leadership structure within which there are different levels of responsibility and commitment. Within our structure, we practice our value of shared leadership. MUA recognizes that there are different leadership styles and distinct strengths of each leader. We believe that our organization is strengthened by a shared leadership model where we compliment our abilities and share the work. We promote this model via our Co-Director structure, our work teams, and our leadership committees within the membership.